Living in Kent for twenty years, I eagerly sought out trout in a county which has its share of chalk streams, but the county waters are shallow and under protected and predated both by bird life and poaching. There are trout in the Darent(h) and the Cray, and further out of London, the Eden and Teise, but perhaps the most prolific (and attractive) river is the Stour. 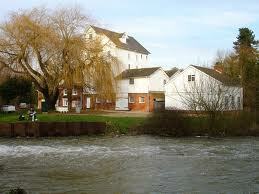 In the nineties, I fished and caught trout in both the Teise and the Stour. The river is mostly swift flowing over gravel, with streamy sections alternating with deeper pools. Good summer flows are maintained by water discharged from Bewl reservoir. I was a member of The Teise Anglers & Owners Association for a few seasons and it controls approximately eight miles of the river, deep in the heart of the beautiful Kentish countryside, between Goudhurst, Marden and Collier Street . A typical small stream where careful casting is a must, to the patient it yields a few fish, and I found mainly the stocked browns, and the odd rainbow, and nearly always on nymphs. sitting on a stretch of water owned by South East Water, which includes a beat a few miles downstream at Thannington. When I first fished the river here, it was a day ticket water run by Mid Kent Fisheries. Wadeable, and gently flowing through the Mill grounds it contains surprisingly large fish which gorge themselves on shrimp and a healthy diet of flylife, and offering good dry fly fishing from the A28 road bridge to the pool below the narrow bridge on the alternative stream bypassing but adjacent to the Mill. I stood happily catching brownies from there one evening, but derived as much enjoyment watching the small school of perch swimming around my legs! And, there is plentiful birdlife for distraction during dog days…..it is a very pretty and calming place. At about the Millenium, it converted to a Members’ Syndicated water, and I was lucky enough to be invited to fish the Thannington stretch by Richard Wise, a member there, as well as a fellow member, with me, of Trossley Fly Fishers (Chaired by Fellow Master, Mike Stemp!) near home. Last year, SEW announced that following a strategic review of assets, it was to sell Mid Kent Fisheries (which includes carp lakes) and the Chilham Mill site. On January 18th this year (2011) the Company announced the sale to a management buyout led by Chris Logsdon, who has run the fishery successfully for twenty years…..good news, indeed.